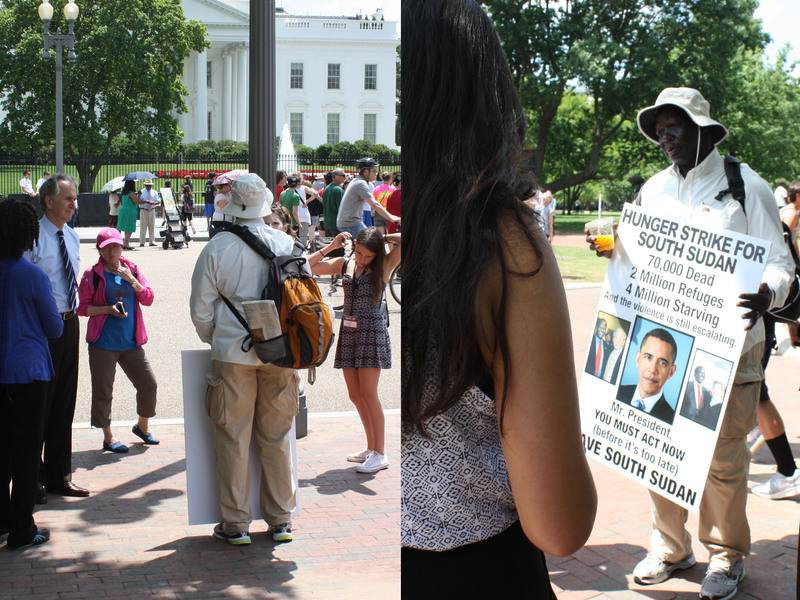 On May 15, South Sudanese human rights activist Simon Deng began “a hunger strike for South Sudan.” In addition to fasting and protesting outside the White House for the past 6 days, Deng has released an open letter to President Barack Obama calling on the U.S. government to play a more active role in supporting peace in South Sudan. Deng’s hunger strike comes at a time when the civil war has intensified, with brutal attacks on civilians by South Sudanese President Salva Kiir’s government forces, former Vice-President Riek Machar’s SPLA-IO, and other opposition forces. In March, the United Nations Security Council adopted Resolution 2206 which lays the groundwork for imposing targeted sanctions on the rulers and other individuals responsible for, or complicit in, or that had engaged in – directly or indirectly – actions that threatened the country’s peace, security, or stability. The war rages on however, with no peace deal in sight and sanctions have yet to be implemented. Deng’s letter calls on the U.S. government to lead in bringing Kiir and Machar together to end the war, as the U.S. had on South Sudan’s path to independence, and immediately impose strong sanctions. Deng also calls for an arms embargo to stop of the flow of arms fueling the violence, the creation of an interim government where all stakeholders are represented and respect the rule of law and human rights, and help in monitoring how aid funds are being allocated.
" … How did we get to such a terrible place? How could we have fallen so far from the jubilation of independence? And what can be done to save South Sudan? … We must make threats to impose harsher sanctions—including on South Sudanese oil exports—and be unafraid to follow through on them. We need a serious arms embargo, and there must be negative consequences for countries that insist on playing a nefarious role in South Sudan’s tragedy (such as Uganda). We need real leadership from the United States. Mr. President, you are the only person in a position to stop the carnage. Before your planned trip to Africa in June, you must speak to South Sudan’s rulers with force and conviction. Read his full letter to President Obama. Follow the Hunger Strike for South Sudan Facebook page. Call the White House comment line to let them know you support Simon Deng’s efforts to raise the profile of South Sudan for the United States government- 202-456-1111. Simon Deng was kidnapped and enslaved as a child in Sudan and later received asylum in the United States. He is now a U.S. citizen and has been advocating for peace in Sudan and South Sudan for more than a decade. In 2010, Deng walked 250 miles from New York City to Washington, D.C. to "shed light on the referendum in southern Sudan, the genocide being perpetrated against the people of Darfur, and the continuation of slavery and other human rights violations throughout Sudan". Editor's Note: This blog was written by staff Meghan Higginbotham and Lindsey Hutchison. Photo credit: Enough Project.